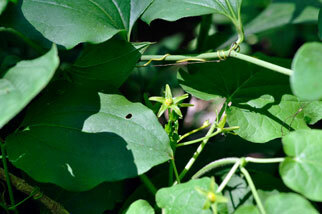 Stems: Twining, slender, simple or branched, 3 to 10+ feet, pubescent, sometimes also glandular-puberulent. Leaves: Opposite; petiole .8 to 4.8 inches; blade broadly ovate to nearly round, 3 to 6 inches long, 1.8 to 4 inches wide, widely spreading, base cordate, apex acuminate, sparsely pubescent abaxially. Inflorescences: 2-12 flowers in leaf axils, umbel-like; peduncles .4 to 1 inch; pedicels slender, .4 to 1.2 inch, usually glabrous. Flowers: Flowers to .6 to .8 inch diameter; calyx .1 to .24 inch, lobes 5, triangular to narrowly lanceolate, basally connate, glabrous except hairs at tip; corolla yellow to yellowish green or greenish purple, lobes spreading, linear-lanceolate, .28 to .6 inch, widely spreading, glabrous abaxially; corona a flattened, fleshy, 5-angled disc; gynostegium sessile. Fruits: Follicles spindle-shaped, 5-angled in cross-section, 3 to 6 inches long, .8 to 1.1 inch thick, smooth, glabrous; seeds elliptic, .24 to .4 inch; coma white, 1.4 to 1.8 inches long.